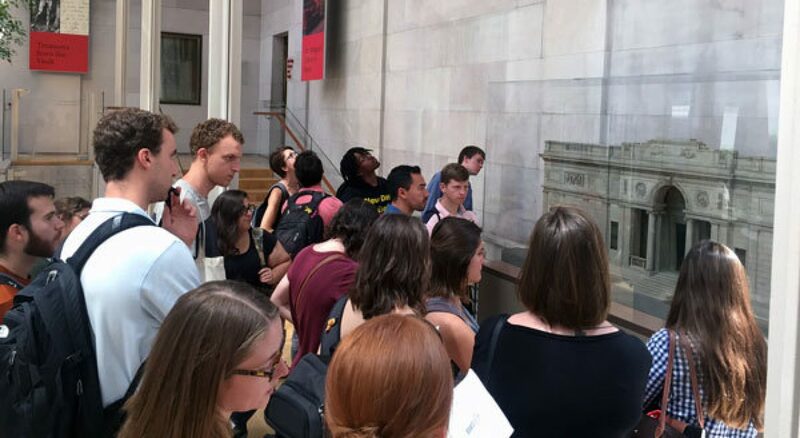 Follow the ICAA’s Summer Studio in Classical Architecture program, from June 19th through July 15th, as students from across the country spend four weeks in New York City and the surrounding region exploring the ideas, methods, and issues related to classical architectural design. July 15, by Tatiana Amundsen: On Saturday, we arrived at the ICAA library to find rows of chairs facing our final projects, which we had pinned to the wall the previous evening. We were also greeted by the familiar faces of many of our instructors and mentors, who had come to see and review our work. We presented our final project, a theoretical pavilion in Prospect Park, in groups of three. We explained our approach to the design and discussed everything from eliminating lines to the purpose of a gate. After presenting, the students were awarded certificates, invited in as official ICAA student members, and given a copy of "The Classicist". Following the award presentation, we went upstairs for lunch at the Coffee House, where we were able to say our last goodbyes to the other students, professors, and mentors. July 14, by Ximena Vidales: It has been four weeks since we began the Summer Studio, and it’s hard to believe that the final day is upon us. We spent our last day working in the studio, finalizing all the details for our major projects. After laying out our designs, we had to go back and create line weights to ensure that our drawings could be read from a distance. At the end of the evening we pinned our designs to the wall for the final review. It was truly inspiring to see all the new skills we have learned being incorporated into our projects. 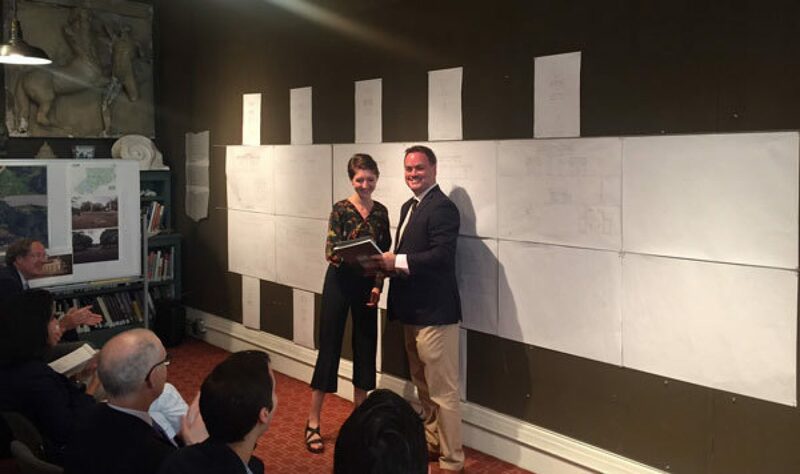 July 13, by William Portales: On Thursday we had our final lecture of the program, an inspiring presentation by Andrew B. Cogar, President of the architecture and planning firm Historical Concepts. 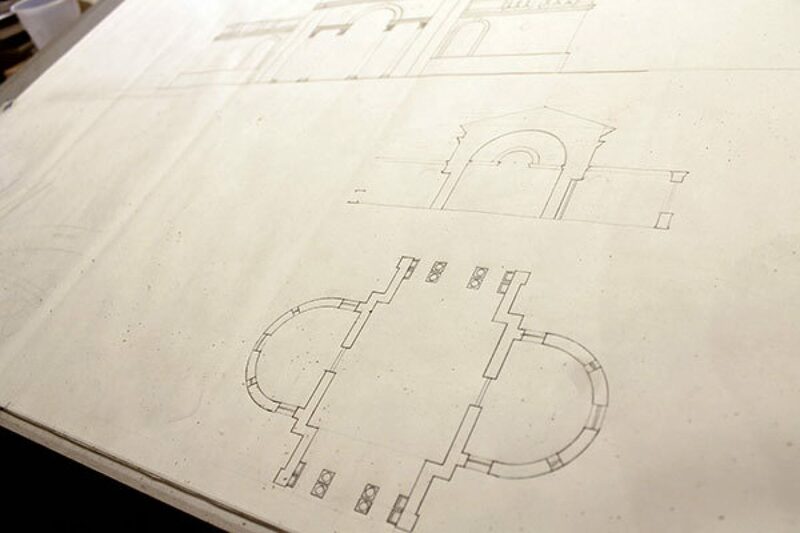 His firm designs everything from small houses to town master plans, and it was fascinating to hear how the elements of classical design can be scaled up and applied to the context of town planning schemes. The afternoon was spent diving headlong into our final designs and preparing drawings for review on Saturday. 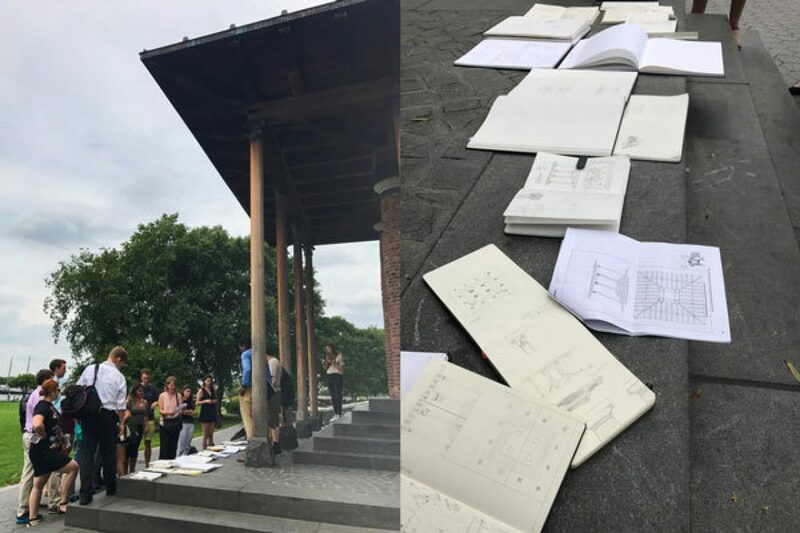 We are designing a theoretical pavilion in Prospect Park and it has been a great opportunity to put all the skills we have learned over the past four weeks into practice. July 12. 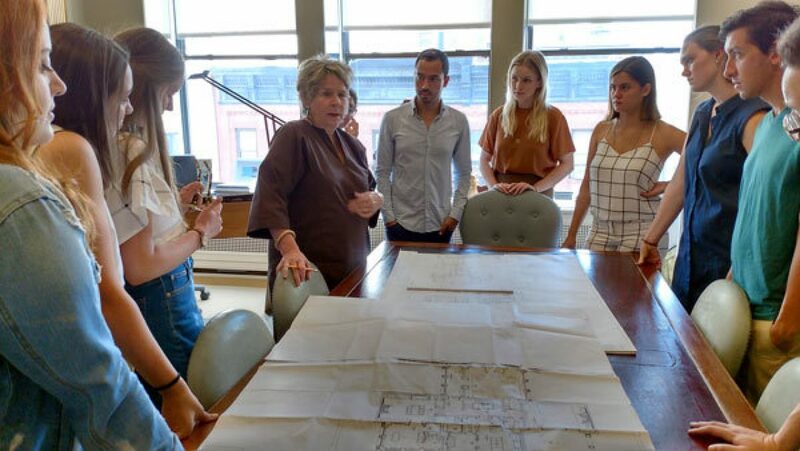 By Reed Thompson: On Wednesday morning we visited the offices of Bunny Williams Inc., our final firm visit of the Summer Studio. Here, interior designer Bunny Williams walked us through the key aspects of her practice and spoke of the how interiors are an integral part of holistic architectural design. She taught us the importance of good spatial sensibilities and why the space one is working in needs to be considered before any discussion of colors or materials can take place. Sketching, she added, is also a great teaching tool for designers, as drawing helps us to absorb information and embed in our minds what our eyes see. The afternoon was spent setting up our presentation drawings for the final design project. 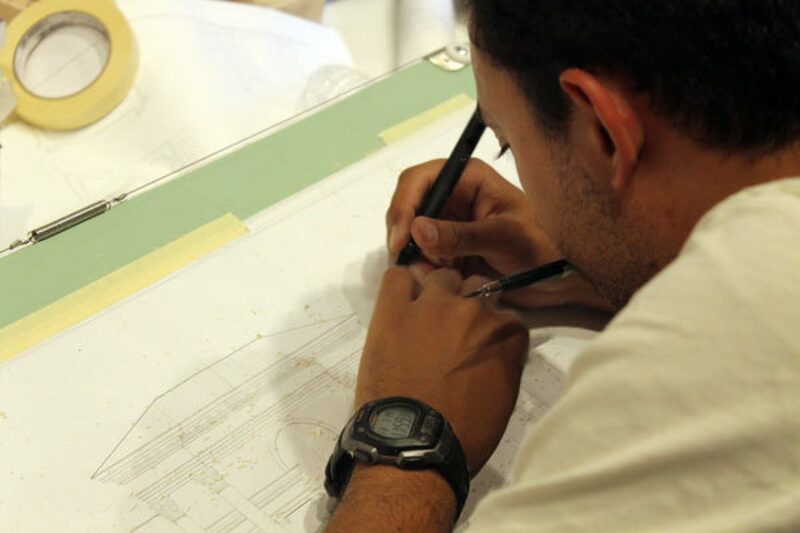 We have now composed our designs – elevations, plans, and sections – for the final boards that we will be presenting. It is amazing to see the variety of design schemes that everybody has been working on as we put into practice what we have learned over the past few weeks. 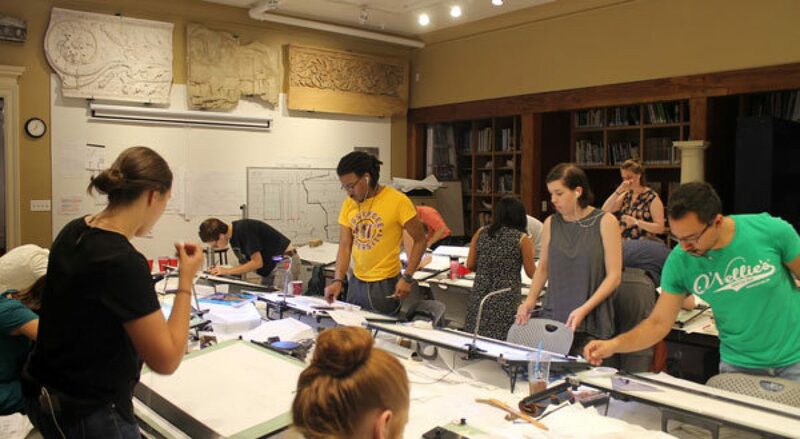 July 11, by Patrick Vercio: Tuesday morning began with our final class of the Summer Studio, led by Kalinda Gathinji, who taught us about tectonics and how this affects building design. 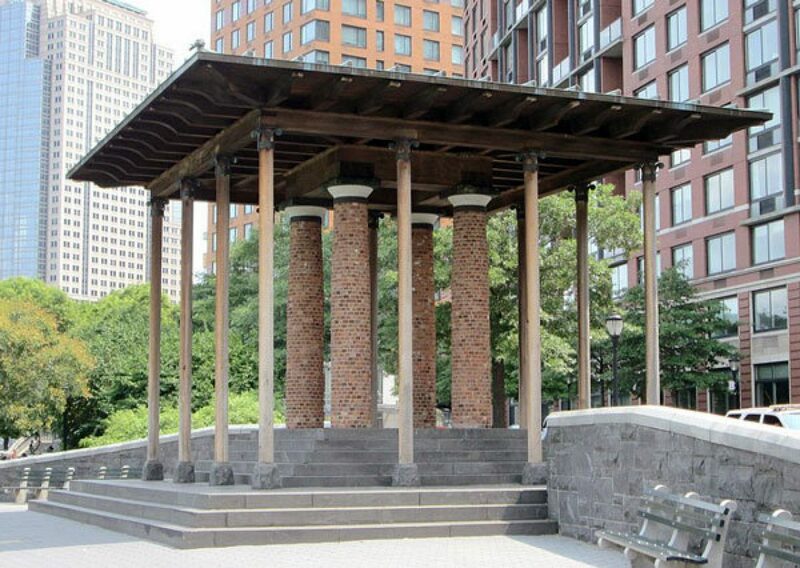 Following this lesson, we traveled to Battery Park where we did a measured drawing of the Battery Park City Pavilion, designed by Demetri Porphyrios. The pavilion’s design leaves the structural elements exposed and portrays the transition from primitive architecture towards a classical order. After lunch we continued working on our final projects in the studio. 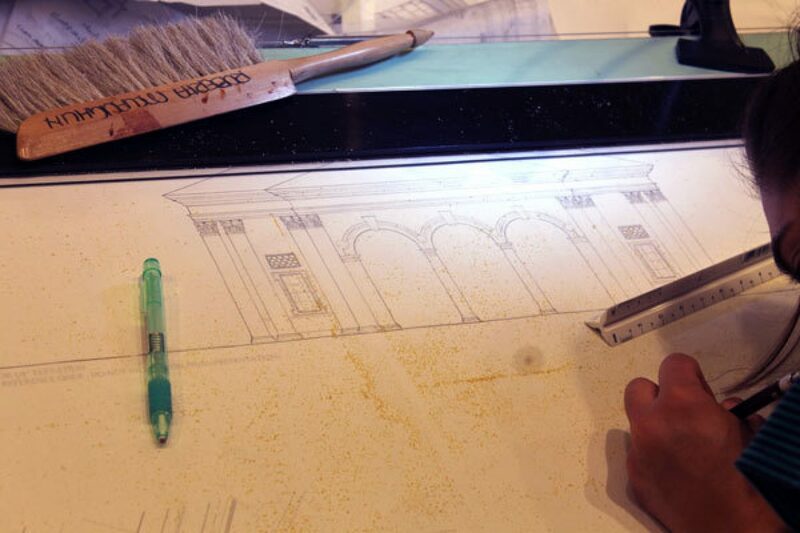 Everybody spent time finalizing details and making last minute adjustments on trace paper, before we begin drafting on velum. We are all excited to see each other’s final compositions at the conclusion of the studio. 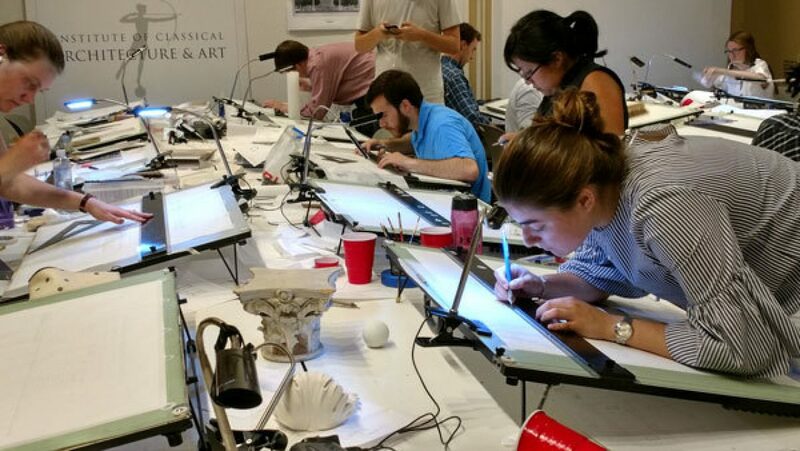 July 10, by Molly Kase: Monday morning was spent in the ICAA's Cast Hall, an inspiring space that contains the ICAA's historic plaster cast collection. 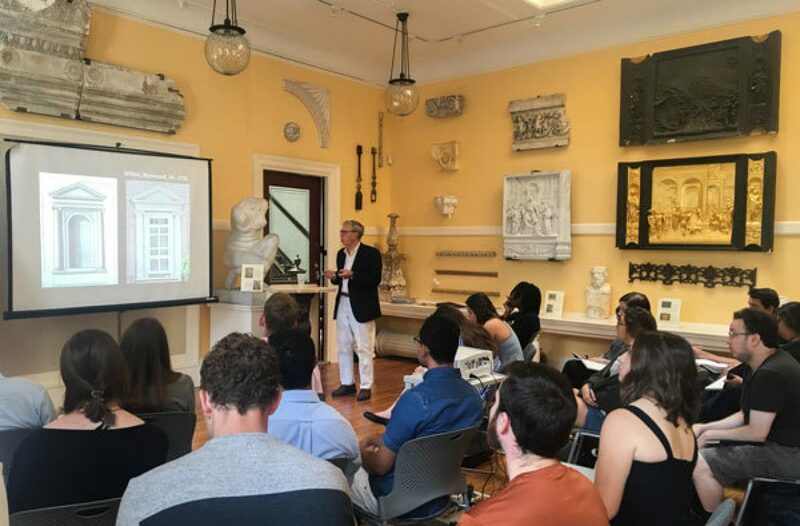 Here, architectural historian Calder Loth gave a lecture on the wide range of literature that has chronicled the advancement of classical architecture throughout history. We then had the opportunity to go to the ICAA's library and find examples of many of these works. After lunch, we met at The Morgan Library and Museum, where we were split into two groups. 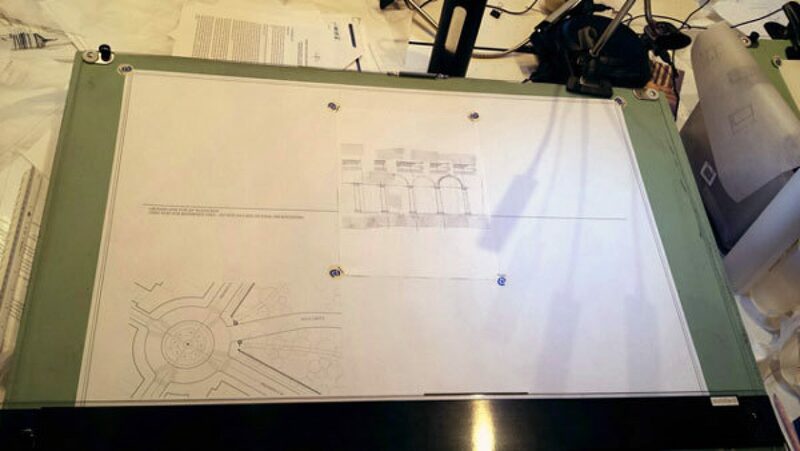 One group went to look at some of the books from Calder Loth's Lecture in the library archives, while the other did a measured drawing of the library's rotunda. 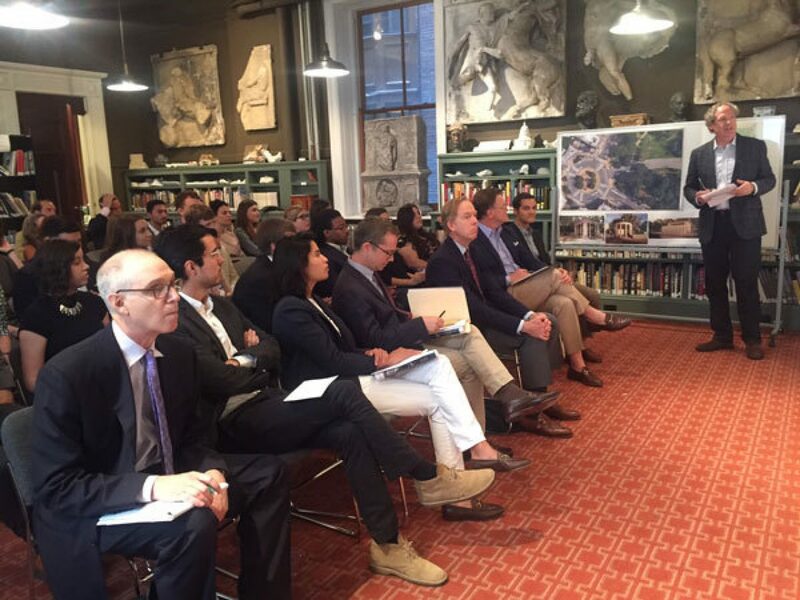 Following dinner, we returned to the ICAA for a lecture by Gregory Hoss on the firm David M. Schwarz Architects, Inc., where he is Principal and President, as well as their design process. 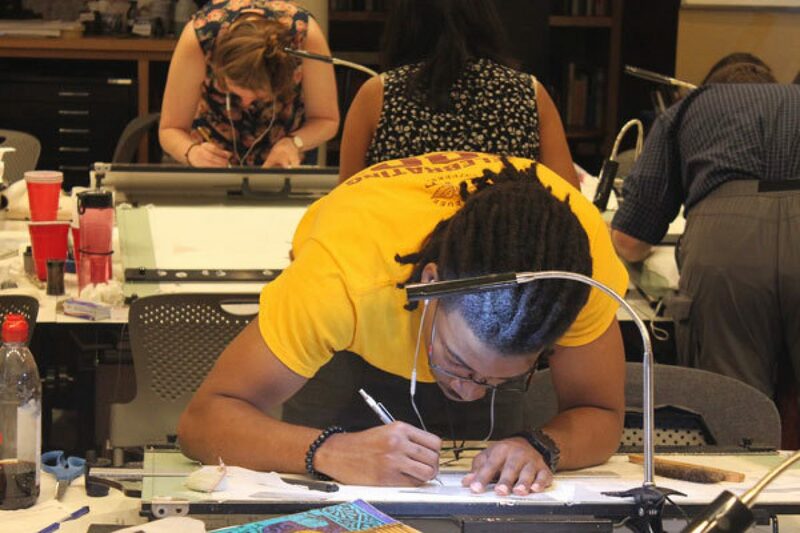 The rest of the night was spent working on our final projects, getting them ready to begin our finished drawings.